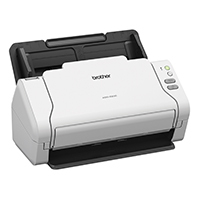 The Brother ADS-2200 high-speed duplex color scanner is ideal for sole practitioners and home office professionals with simple workflow applications that need reliable, fast scanning. Its compact design is ideally suited for a variety of office environments. The ADS-2200 offers Hi-Speed USB 2.0 local connectivity, 35 ppm¹ color and black/white single pass duplex scan speed and a 50-sheet capacity auto document feeder.